After graduating from the Chinese University Hong Kong BA(Music), Diana Cheung pursued a career in education. She has been a choir conductor of children aged 4-11 and later become a school music teacher in Band One schools such as St Paul's Secondary School and St Paul's College. The school teaching experience enriches Diana's teaching pedagogy in harp and piano. She never ceases her passion in pursuing a career in harp training and performance and targets on training the best harp students. Her harp lessons includes harp & piano students of all ages and levels. As an experienced harp teacher, Diana aims at providing high-quality lessons and helping her harp students to build a solid foundation on their skills on playing harp. Benefiting from the school teaching experience, she knows how to cater for student diversity. She has taught and mentored students from children to adults, from school students, college students, working ladies and gentlemen, mothers to retirees (you're never too old or too young to learn harp!). Diana insists to use a concert grand harp for teaching, which is capable of producing more complex and diverse pieces than the smaller celtic harps. 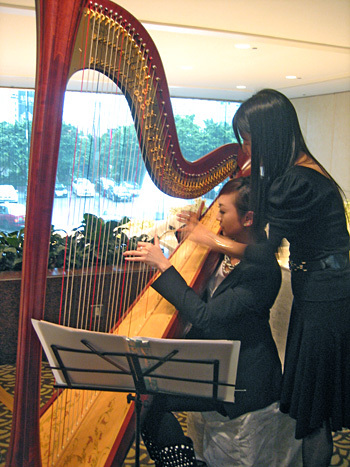 Diana provides all levels of harp exam for her harp students! Don't hesitate and sign up! The latest Harp syllabus from 2011-2014. Please feel free to contact Diana Cheung the Harpist for an extraordinary event with an Elegant Harp Performance or Harp Teaching!